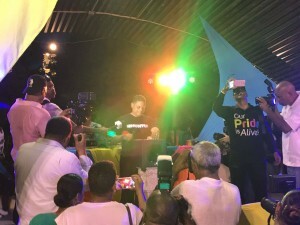 WILLEMSTAD - The Prime Minister of Curaçao Eugene Rhuggenaath has called during the Gay Pride Parade in Willemstad for more acceptance. He said not to accept if people live in fear because of their sexual preference. Gay activists in Curacao call the speech "historical". There was criticism when it was announced that Rhuggenaath would open the Gay Pride. That is why he explained why he wanted to be present, he said in the speech. According to Rhuggenaath, Curaçao has a diverse society that welcomes and embraces all kinds of people. He named some heroes of the country, including slave leader Tula, first premier Da Costa Gomez and homosexual activist Mario Kleinmoedig. Premier Rhuggenaath also opened the Gay Pride of Curaçao last year. In 2013, the first edition of the event was canceled at the last minute because the police indicated that it was too dangerous to carry flags. A Member of Parliament of the former coalition party Pueblo Soberano called on church leaders to express their horror about homosexuality.